I'm very excited to be performing with Michael Martin Murphey on his Cowboy Christmas Tour this month! Between December 2nd and the 21st, we will be performing a total of 16 shows throughout Texas and Oklahoma. More information about the tour dates are outlined below. Its going to be a busy month, so be sure to keep an eye out on social media for announcements about appearances that I may do along the way. To get more info about the Cowboy Christmas Tour visit the Michael Martin Murphey website. Tuesday, December 2 @ 7:30 p.m.
Thursday, December 4 @ 7:00 p.m.
Friday, December 5 @ 7:00 p.m.
Saturday, December 6 @ 7:30 p.m.
Sunday, December 7 @ 7:30 p.m.
Thursday, December 11 @ 7:00 & 9:30 p.m.
Friday, December 12 @ 8:00 p.m.
Saturday, December 13 @ 8:00 p.m.
Monday, December 15 @ 7:00 p.m.
Tuesday, December 16 @ 7:30 p.m.
Thursday, December 18 @ 8:00 p.m.
Friday, December 19 @ 8:00 p.m.
Sunday, December 21 @ 7:00 p.m.
With the cold winter winds and fresh falling snow burying the autumn leaves, mid November is upon us. I have been looking forward to this time of year for the last 11 months and now it is finally here. Where did the time go? Where does the time go really? The anticipation for things that we are either anxiously or dreadfully awaiting makes the days, weeks, and months seem to drag on until the time has passed and we can't recall half of what was entertaining our minds. For all the bad that happens in our lives and for all the good, when I reflect back; I am always thankful for it all. Every moment. I am HERE. TODAY. For a reason and I am thankful. 2015 is just a mere 6 weeks away, Christmas is 31 days away, and leaving only 4 days until Thanksgiving. As we are about to gather with family and loved ones, I reminisce on all that has happened over the last year and my heart fills with thankfulness. Everything that I have longed for thru determination, hard work, and a full spirit collides in this moment. My soul feels like it's ready to burst thru my chest and my mind clears and happiness becomes my blanket of warmth. I wish everyone could feel the way that I feel right now. I have so many things to be thankful for this year. I am extremely thankful for the friendships that I have made throughout the music and hunting industries. Some of the friendships I've made this year are some of the greatest I have ever had since high school. Many of the friendships are feel like those close friendships we all had back in high school. Almost like we're family. Family from day one. I wouldn't trade those friendships for anything. I have been blessed to be working with some of the greatest people and products in the music, hunting, and outdoor industries. I cannot say thank you enough to Craig at Minus 33, Chris from Predator Camo, Garrett with Grizzlystik, Bruce at Weber mandolins, and Alex with Orange Amplifiers. These are just a few of the people that really "got it" and believed in me. We have so many great things in the works for 2015 and I am beyond excited for what is about to come! I can't wait! 2014 was an amazing year in music for me as well. I am thankful to be working with Carrie Underwood for over 7 years now and going strong. I had the opportunity to perform with Dierks Bentley on the Riser Tour as well as film a DVD with Christian artist, Guy Penrod this fall. As I write this, I sit in a cabin in Colorado feeling so grateful and thankful to be on a Christmas Tour with legendary, Michael Martin Murphey. I have been surrounded by not only extremely talented vocalists, but they are some of the greatest people I could ever associate myself with. 2014 has been a year of greatness. I am thankful for the comfort of knowing God is in control of my life. With him, EVERYTHING is possible and that is the truth. Thank you for giving me the inspiration and motivation every day to pursue my passion. With all the exciting opportunities ahead, it's family that is most important and is keeps me pushing forward, pursuing my dreams. Without them, there would have been a lot of days that I would have wanted to give up. Their support is means everything. From my family to yours, we wish all a wonderful Thanksgiving this year and I encourage you all to stop holding back from pursuing the things that your heart wants and that your soul needs. Let go of grudges, forgive all, and pray often. Decide to be happy and do all things for the right reasons. Weber: Where to start…you’re a multi-instrumentalist on tour with Carrie Underwood and an avid hunter but what do people not know about Jimmy Herman? Jimmy Herman: Well, here are a few randoms that a lot of people may not know. I grew up near a small town in Western Wisconsin called, Pleasantville. I started playing fiddle at age 4. I cut my teeth on polkas and old-time fiddle tunes that I would play in my dad's band. Was President of my FFA chapter. I'm a certified taxidermist and had a full-on shop in Wisconsin that I owned and operated until I moved to Nashville. I believe I am one of the only people in Nashville that actually owns and plays a Hurdy Gurdy. New Hunting Video Trailer and Giveaway! I'm excited to release my first fall hunting preview video, along with a huge giveaway! Partnered with Predator Camo, Minus 33, and Grizzlystik, the preview is just a teaser of more online hunting videos that will document my adventures hunting North American big game trophies. I am grateful to have the honor to work with some of the best companies in the hunting and outdoor world, and we've put together an awesome prize pack that you can enter to win throughout this week. A winner will be randomly selected on Friday. Watch the video here, and enter the contest below! I'm on a mission to find someone that is new or relatively new to the sport of bowhunting, that has a burning passion for everything bowhunting, and that has faced some challenging obstacles in their life that makes them so deserving of tagging that trophy of their dreams. Either tag them in this Facebook post or send me a private Facebook message and let me know their stories and what their dream hunt would be! 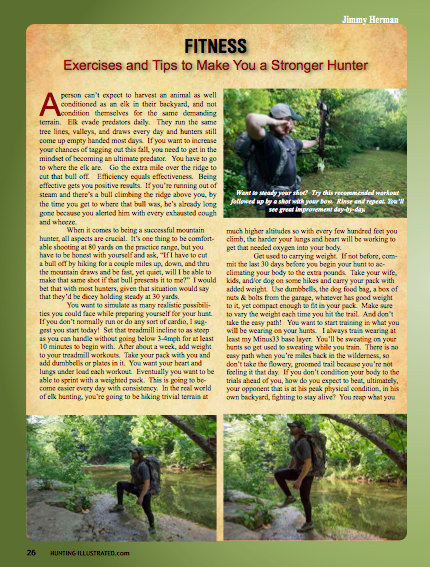 In the latest issue of Hunting Illustrated, I share some exercises and tips to make you a stronger mountain Bowhunter. Pick up the issue and turn to page 26 to check it out! I've spent the last week in the mountains of Idaho bowhunting elk and had perfect situations to put my Predator Camo through the ringer. It is amazing how well Predator patterns work in the western states. The 3D Deception is a perfect pattern for hunting in open areas covered by sage brush. The Green Deception pattern works great in heavy timber found on the mountains as well as any terrain populated with any pine. I also used the Green Deception in the swampy bottoms where the elk tend to hide with tall willows. The Brown Deception is a great pattern for any western terrain. It works great from everything from heavy timber to sage brush all the way down to the bottom in the wetlands. I even wore different patterns in combination with each other to break up my outline even more at times. 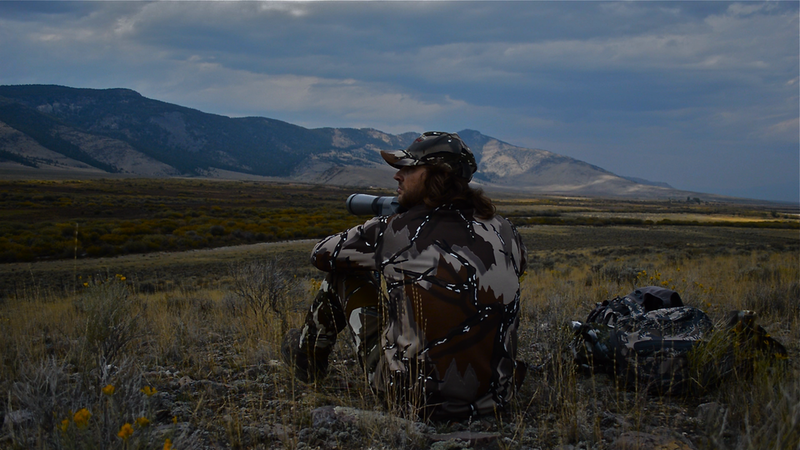 Predator is also the most athletic fit clothing that I have ever worn on any hunt in the past. It breathes, it's warm, and it isn't restrictive. Predator Camo is the toughest all around product that I have ever used. Learn more at PredatorCamo.com. Jimmy Herman partners with Predator Camo to promote the outdoors lifestyle to music fans. "Predator Camo is super ecstatic to announce our partnership with Jimmy Herman,” says Chris of Predator Camo. “Being a Wisconsin based family company and Jimmy being from a small town about an hour north of us, we couldn’t be more eager to work with Jimmy as he grows his outdoor presence and continues his outstanding music career playing alongside Carrie Underwood. This will help get exposure for Predator Camo in a market that is familiar with hunting but may not know of Predator Camo. We couldn’t be happier to have Jimmy Herman join the Predator Family and for him to represent our brand." Jimmy Herman adds, "Predator has watched it's competitors come and go over the decades and still sits at the top of camo patterns on the market. I wear the best. That's why I wear Predator." Based in La Crosse, Wisconsin, Predator Camo’s main goal is to keep hunters unseen through an unmatched quality of patterns and products. Learn more at predatorcamo.com. I'm excited to be partnering with Minus33 Merino Wool Clothing to promote the outdoors lifestyle. Here's an excerpt from the official announcement! “We are pleased to announce that Jimmy Herman is the newest member of the Minus 33 family," says Craig Sexton of Minus33. "When evaluating any potential partnership or endorsement deal, we are very selective. Jimmy's love of the outdoors and passion for fitness fits extremely well with our brand identity. He is also a man of integrity which was also very appealing from a business perspective. We look forward to working collaboratively with Jimmy on several different fronts in the coming months." When he's not on the road, Herman is active in the outdoors. From growing up dairy farming in Wisconsin to bowhunting to feed his family now, Jimmy is no stranger to the apparel needs of an active lifestyle. "Whether I'm training in the gym or hunting on the mountain, I'm going to be wearing the best base layer for those extreme hot and cold conditions," says Jimmy Herman. "Minus33 is the best." Minus33 was founded on the notion of creating high quality performance garments for the active outdoor community. Headquartered in Ashland, NH, they believe nature has given us the best material for clothing, merino wool. Their textile roots date back over 100 years and they are committed to the quality of their products and their customers. As the summer fun of lakes, boats, and scant bathing suits comes to a close, I am quickly reminded that with summer’s end, there is only a short number of days before I am in the western mountains of Idaho. The sounds of boat motors and laughter turn to complete silence. Watching baseball games in the hot summer sun turn to watching your breath rise in the brisk air of a fall dawn. Suntanned skin is soon to be covered by a warm base layer of Minus33 and camo outer shell. The sound of screaming crowds will soon transform into eerie, ghostly bugles of bull elk. Oh, the anticipation! This year has flown by for me and as elk season quickly approaches, I am more at ease going into the fall knowing that I took the time and dedicated myself to training hard and shooting my bow consistently over the entire year in preparation. For me, hunting has become a quest or journey. It has changed my life much like having a family has changed my life. Training for elk season has created a layer of protection, an armor, around the mental and subconscious. That protective layer is a silver shield of both confidence and second nature. As important as weight training, conditioning, and shooting accuracy is for me, my real focus comes down to being mentally conditioned to be patient in those “make or break” moments of closing the gap between getting a bull to take those extra couple of steps into bow range and then having nerves of steel in sealing the deal with one shot. It takes more than dusting off the diaphragm call the week before the trip and shooting your bow a hand full of times to see if the sight was bumped when you put it back in the closet last fall. It’s being prepared from the moment you step off the plane to the moment you put your hands on that bull. It’s the whole in between. If you haven’t prepared yourself mentally for the scenarios that are ahead of you in the field, when the heat is on, you don’t want to crack under the pressure. Familiarize yourself with vocalizing with elk. Know your way around those calls. Shoot your bow. Shoot your bow. And shoot your bow some more. When you draw your bow back, your anchor should never move an eighth of an inch within 100 shots. All you should be focusing on is putting that pin on the vitals and the shot execution should be an automatic happening. Every time. The difference between a person that shoots bow and an archer is the exact same difference in a person that golfs and a golfer: technique and metal preparation. Anyone can shoot a bow or swing a golf club. It’s not rocket science. But in order to make consistent, accurate shots, you need the technique. And that technique needs to be consistent. When drawing back on that bull, you don’t to look OCD by touching the string to your cheek 5 times to get the pin to finally be centered in the peep. You draw once and immediately the pin is centered. There are several factors that come down to technique when making a consistent shot with a bow. Bow grip, anchor point, trigger squeeze, etc., is not something you can master consistently by only shooting a few arrows a year before heading to the mountains or the tree stand. It takes getting out in your backyard before or after work every day and blind bale shooting for days and days first, getting the technique down before ever trying to put a pin on a quarter sized dot at 30 yards. Familiarizing the subconscious with how it feels to make a perfect shot is where consistency begins to stick. This needs to become second nature. This is where the silver shield begins to form around the mental and subconscious. Once the technique of the shot sequence is locked in the brain, the confidence layer begins to grow very strong, very fast. The actual physical training and conditioning, I have been doing for years and years. With the focus turning to getting in “Elk Shape,” I incorporate more “cardio under load” training with my normal weight training routines. Cardio Under Load is basically simulating what it would be like to carry a full pack through the wilderness on an elk hunt. Some days it’s wearing my actual hunting pack with weight in it on the treadmill or stair climber. Other days it could be incorporating sets of weighted lunges on a Bosu ball in between a chest and shoulders workout. In a real life hunting situation, you’re going to need every muscle, big and small. Conditioned or not, they’re all going to work at some point on those hikes through the mountains. So the more acclimated you can be to those conditions, the more efficient your body will be. The body is a tool, a machine. It’s an engine. You can either leave an engine stock or you can modify it. An engine can be modified and strengthened to perform above and beyond its stock potential and still hold together under greater loads. The body is no different. The harder you can train in the off season, the easier it will be to perform under load in prime time hunting season. For me, it’s a quest. A journey. Memories have already been made this year with many more to come in preparation for the “September Calls” and I am extremely optimistic for the future. I encourage you all to dive in and create your own journey. Make it a package deal that when you look back on your hunt, you see it as a 12-month mental photo album and not just a few days’ memories of sweat and exhaustion.